In the Teen Wolf universe, the Kanima is a shapeshifter with reptilian characteristics such as a snake or lizard. However, it's said the kanima is not a natural species. The transformation into a kanima is a mutation of the shapeshifter's gene. It is an abomination. The Kanima's sole purpose is to be an instrument of vengeance. It seeks out a Master who desires revenge upon others. This being will then use the shapeshifter to carry out his retribution, to kill those the Master perceives as murderers. 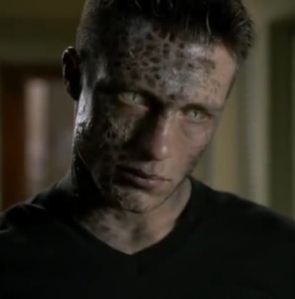 During Season 2, Jackson Whittemore transforms into this shapeshifter, after being Bitten by Derek Hale. 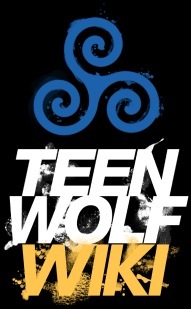 At the end of the season, Jackson is cured of being a Kanima, transforming into a werewolf. In A Promise to the Dead, another Kanima, distinguished by it's scaled claws, appears as a prisoner in the Eichen House level for supernatural prisoners. In Season 5, kanima was the primary genetic makeup for the Chimera, Tracy Stewart. The Kanima is the result of a were-creature's transformation gone wrong. In the Teen Wolf universe, an idiom comes into play: "Sometimes the shape you take reflects the person you are." 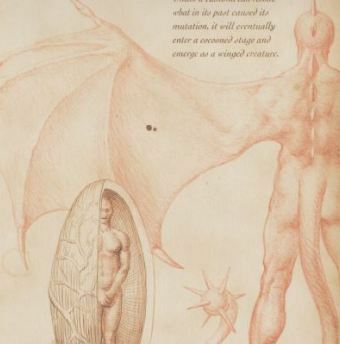 A shapeshifter will transform into a kanima due to the inherent feeling that they lack a personal identity. As a result, the kanima doesn't know what or who it is. It is confused by its own reflection to this end. To this end, they intentionally seek out a Master to become enslaved by, and form a bond with a Master. Jackson's mental issues and outward behavior, his innate desire to make people accept, and be proud of him, his borderline-aggressively competitive nature, and his feelings towards his adoption and being an orphan, resulted in him exhibiting such a mindset. And so, when he was Bitten, instead of a Beta werewolf, the kanima shape manifested. Also, unlike other shapeshifters, the human side of the shapeshifter is displayed as being completely separate from the kanima side. Jackson wasn't immune from the creature's own venom. Stiles Stilinski: "When's the Kanima not the Kanima?" Scott McCall: "When it's Jackson." A kanima cannot become the shapeshifter it's meant to be until it resolves this mental complication, re-gaining it's identity. It then has to be killed. Subsequently, the shapeshifter will be reborn as it's proper species. In Master Plan, Jackson was cured of being a Kanima, finally transforming into a werewolf, adopting a long absent identity when Lydia Martin told him she still loved him. The kanima is reptilian in appearance. In a partial-shift, the beast will initially appear as its human guise with a gradual number of shifted patterned scales. Its primary features include claws, greenish-yellow slitted eyes, and multiple rows of greenish chrome teeth. A Kanima's claws secrete a neurotoxin that renders their victims paralyzed. Often, this is administered via a slash to the back of the neck, so the toxic will go to the spine. When a kanima is fully transformed, it becomes completely bald, it's skin morphs into a dark-green hide, it can scale walls similar to a lizard, and grows a powerful prehensile tail. The kanima can transform into a bigger shape after undergoing an evolution. The venom that secretes out of its claws will form a coccoon which incases the shapeshifter. Eventually, the kanima will emerge a much more powerful creature. Its front clawed limbs will become wings, a row of ridged spikes sprouts from its head, and its tailtip is now a spiked club. As a shapehifter, the kanima is capable of enhanced strength and speed that add to its formidability. In Ice Pick, a kanima, Jackson Whittemore, in his human guise, was able to exert enough strength that he easily lifted his car three feet into the air. In Abomination, the kanima could move around in the school's swimming pool, then leap, and scale up the side of the wall, and jump out the window of the roof with massive speed and reflexes. In Master Plan, Jackson is able to take on werewolves Scott McCall, Isaac Lahey, as well as Alpha Derek Hale with great strength, reactions and durability. In Venomous, Jackson discovers he has enhanced hearing, being able to hear Danny Mahealani turn on a water tap in a bathroom, whilst in a boy's locker room. Likewise, Jackson's able to hear Scott McCall, Stiles and Allison talking fifty yards away from the inside of a van. A Kanima also has a tremendous healing ability. Jackson Whittemore survived an entire round of gunfire from Chris Argent and simply reverted back to human form after Derek tore out the kanima's throat with his teeth in Frenemy, it simply pulled out an arrow to its head and still kept on fighting from being stabbed in the chest and its side with daggers in Fury. In Dreamcatchers, the Kanima Chimera Tracy Stewart had her tail severed, but her damaged flesh repaired itself, the tail remains morphing into her back. The Master of the Kanima is the being who controls and uses the shapeshifter so it will carry out the Master's vengeance. The Master will use the shapeshifter to do his bidding, carry out his orders unquestioningly and kill those the Master deems so. 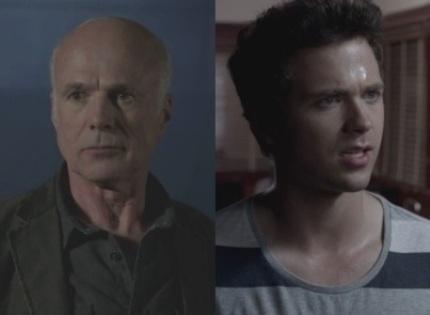 In Season 2, two people became a kanima's master after Jackson Whittemore transformed into such a shapeshifter: Matt Daehler and Gerard Argent. Both antagonists controlled Jackson to commit their crimes throughout Season 2. The Kanima's Master shares a psychic bond with the shapeshifter. Both of them form, implement and solidify their supernatural bond by pressing the palms of their hands together. The Master can communicate with the shapeshifter telepathically, he can sense his servant from miles away, as well as speak through the Kanima by a use of mental projection. When Jackson Whittemore and Matt Daehler touched their palms at the time of Shape-Shifted, the kanima shared it's memory of killing Mr. Lahey with his master. The supernatural bond between the master and servant causes the phobias of the Master to be shared with the Kanima. In his kanima shape, Jackson shared Matt's fear of water, though in his human guise he's a natural swimmer. The Master's personality will also affect the bond influencing the kanima servant's behaviour. In Master Plan, Gerard easily found where Jackson was taken, because he could sense his servant's location so to lead Derek into a trap. In Raving, Matt spoke through Jackson referring to him and Jackson: "We're here." In Season 2, when Jackson became a kanima, his first Master came to be Matt Daehler. Matt was an unhinged teenage boy who held a vendetta against a group of people involved in his near-drowning years earlier when he was a little boy, including Mr. Lahey. Matt, at one point, unintentionally took a photo of Lahey. He looked down the lense of his camera, feeling an unbelievable rage, wishing Lahey was dead. Jackson, who was newly transformed and thus seeking a Master, reacted to this vengeful feeling elsewhere and carried out Matt's vengence. When Matt first saw Jackson in his kanima shape, the shapeshifter was instinctively attracted to him, and vice versa. Once bonded to Jackson, Matt saw that the Kanima had killed Lahey for him. Matt figured out that Jackson would kill again for him. He visited Tucker Cornish, another individual involved in the incident and took another photo. Matt realized the bond between him and his servant had bestowed these new traits power upon him. He just had to take a photo of his victim, or think about it, then Jackson would take their life. Matt used his servant to kill all the people involved in the incident. In Fury, Matt Daeher is killed by Gerard Argent. Gerard then becomes Jackson's new master by greeting the Kanima afterward. This is most likely due to Gerard being a psychopath and his deceptive character, qualities the Kanima presumably searches for in its Master. This could explain why Jackson didn't attack Gerard in Frenemy, because the shapeshifter saw Gerard as a noteworthy Master. The rules concerning the Kanima is specifically that the Master is to use the Kanima to kill murderers, individuals who have taken lives. If the Master uses the shapeshifter to kill innocents, or if the Master takes lives himself, that breaks the rules of the curse. Matt committed such acts and Matt began to consequently transform into a Kanima himself. Derek Hale: You can't just break the rules. [...] The universe balances things out. Always does. Like the wolf its power is greatest at the moon's peak. Like the wolf the Kanima is a social creature but where the wolf seeks a pack the Kanima seeks a master. The Kanima a weapon of vengeance used to carry out the bidding of its master. The Kanima was once used by a South American priest who took it upon himself to rid his village of all murderers. The bond between master and servant grew stronger until the will of the master became that of the Kanima's and whomever the priest deemed unworthy the Kanima served his vengeance. In Venomous, Stiles' initial research depicted the beast as a werejaguar from South America that goes after murderers.